, an eminent antiquary, descended from a very ancient family, was born at Leeds in Yorkshire, Aug. 16, 1658, and was the son of a reputable merchant, and after some education at the grammar-school of that place, was sent, in 1677, for further improvement, to | London. The father possessed a good share of learning, and had a peculiar turn for the knowledge of antiquities; which being inherited by the son, he employed his leisure hours in visiting remarkable places, copying monumfntal inscriptions, studying their history, and particularly collecting accounts of protestant benefactions. His father, designing him for his own -business, sent him in 1678 to Rotterdam, in order to learn the Dutch and French languages, and to be perfected in mercantile accomplishments: but he was obliged to return the year following, on account of his health. On the death of his father, in 1680, he entered on his business: and, though merchandize was his profession, yet learning and antiquities took so firm a possession of his heart, that, contenting himself with a moderate patrimony, he made those researches the great employment of his life. There is a circumstance relating to him, in the unhappy times under James II. which we cannot pass over. He had been bred among the presbyterians; but, never imbibing any of their rigid principles, had always occasionally conformed to the established church: and now, when popery began to threaten the nation, he more frequently attended its worship, with a view of promoting an union among the protestaots for their mutual preservation. His presbyterian pastor was highly displeased with his compliance, and treated him with a very indiscreet zeal. This prompted Thoresby to examine more closely the arguments on both sides, and apply to his diocesan and friend archbishop Sharp (who, by the way, had a good taste for coins and medals, and collected a curious cabinet of them), who treated him very affectionately, and by letters and personal conversation settled him in full communion with the established church. Thoresby was well respected by the clergy and gentry of his town and neighbourhood, and by all the eminent antiquaries and men of learning of his time. It would be almost endless to enumerate the assistances which he gave in one way or other to the works of the learned. 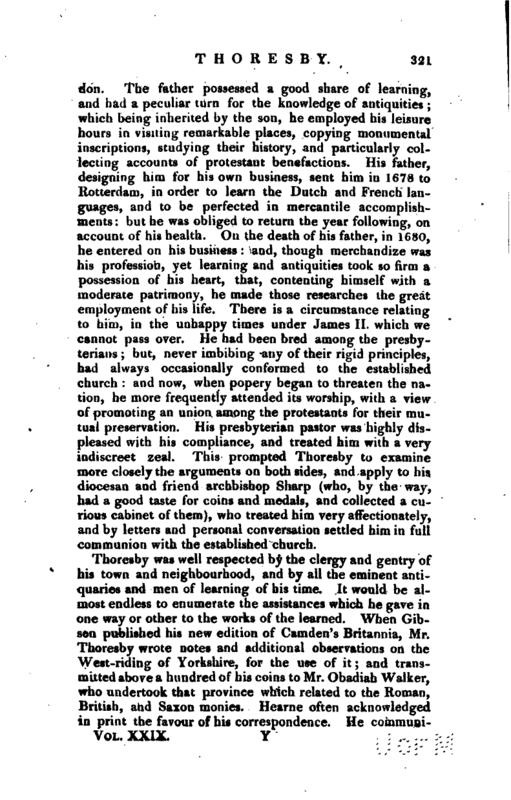 When Gibson published his new edition of Camden’s Britannia, Mr. Thoresby wrote notes and additional observations on the West-riding of Yorkshire, for the use of it; and transmitted above a hundred of his coins to Mr. Obadiah Walker, who undertook that province which related to the Roman, British, and Saxon monies. 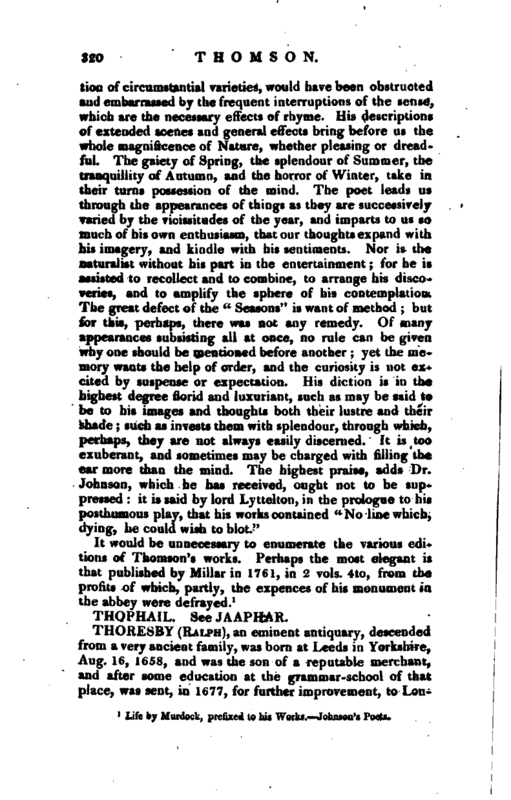 Hearne often acknowledged in print the favour of his correspondence. He | communicated to Strype some original letters in his collection. He imparted to Calamy memoirs of several northern divines for his abridgment of “Baxter’s Life and Times” as he did also of the worthy royalists to Walker, for his “Sufferings of the Clergy,” which was published as an antidote to Calamy’s book; esteeming good men of all parties worthy to have their names and characters transmitted to posterity. 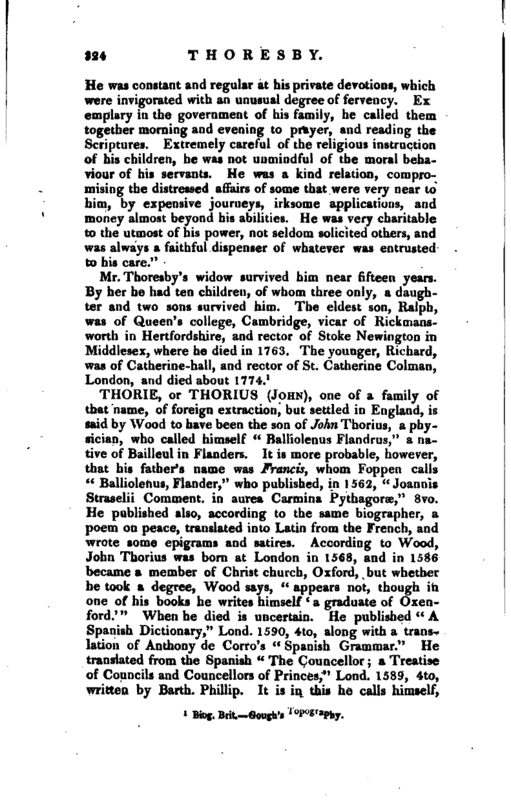 His skill in heraldry and genealogy rendered him a very serviceable correspondent to Collins in his “Peerage of England.” By these kindnesses, sweetened with the easiness of access to his own cabinet, he always found the like easy admission to those of others; which gave him frequent opportunities of enlarging his collection, far beyond what could have been expected from a private person, not wealthy. He commenced an early friendship with the celebrated naturalist Dr. Martin Lister. 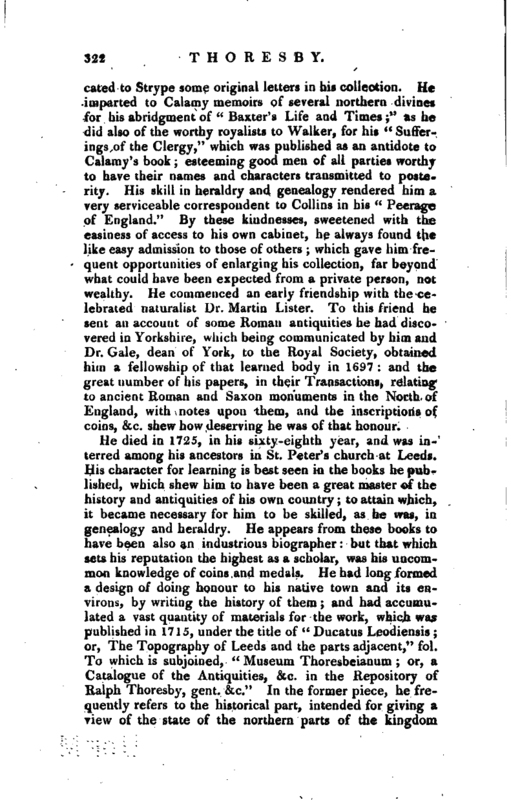 To this friend he sent an account of some Roman antiquities he had discovered in Yorkshire, which being communicated by him and Dr. Gale, dean of York, to the Royal Society, obtained him a fellowship of that learned body in 1697: and the great number of his papers, in their Transactions, relating to ancient Roman and Saxon monuments in the North of England, with notes upon them, and the inscriptions of coins, &c. shew how deserving he was of that honour. He died in 1725, in his sixty-eighth year, and was interred among his ancestors in St. Peter’s church at Leeds. His character for learning is best seen in the books he published, which shew him to have been a great master of the history and antiquities of his own country; to attain which, it became necessary for him to be skilled, as he was, in genealogy and heraldry. He appears from these books to have been also an industrious biographer: but that. which sets his reputation the highest as a scholar, was his uncommon knowledge of coins and medals. He had long formed a design of doing honour to his native town and its environs, by writing the history of them; and had accumulated a vast quantity of materials for the work, which was published in 1715, under the title of “Ducatus Leodiensis; or, The Topography of Leeds and the parts adjacent,” fol. To which is subjoined, “Museum Thoresbeianum; or, a Catalogue of the Antiquities, &c. in the Repository of Ralph Thoresby, gent. &c.” In the former piece, he frequently refers to the historical part, intended for giving a view of the state of the northern parts of the kingdom | during the dark ages of the Britons and the Romans and of the alterations afterwards made by the Saxons, Danes, and Normans: and he proceeded so far, as to bring his narration in a fair copy nearly to the end of the sixth century, illustrating and confirming his history byhis coins. This curious unfinished manuscript is inserted in the Biographia Britannica, in order to excite some able writer to carry it on, and complete the noble design of the author*. 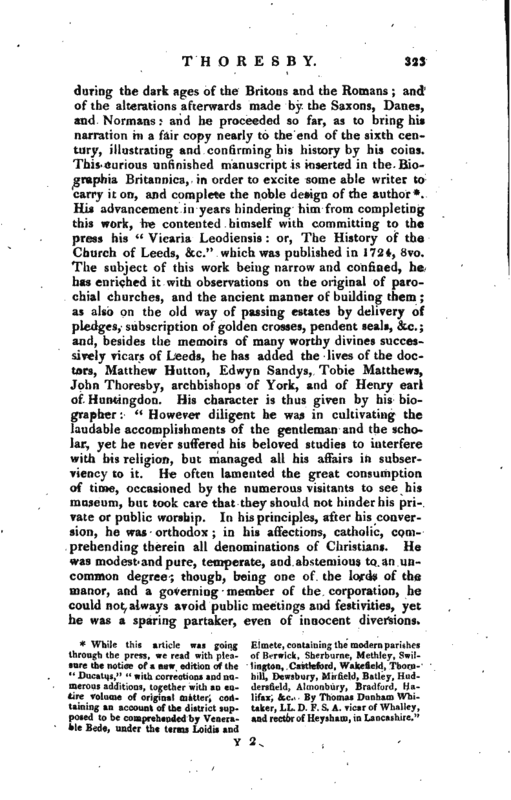 His advancement in years hindering him from completing this work, he contented himself with committing to the press his “Viearia Leodiensis: or, The History of the Church of Leeds, &c.”, which was published in 1724, 8vo. The subject of this work being narrow and confined, he has enriched it with observations on the original of parochial churches, and the ancient manner of building them; as also on the‘ old way of passing estates by delivery of pledges, subscription of golden crosses, pendent seals, &c. and, besides the memoirs of many worthy divines successively vicars of Leeds, he has added the lives of the doc-, tors, Matthew Hutton, Edwyn Sandys, Tobie Matthews, John Thoresby, archbishops of York, and of Henry earl of Huntingdon. His character is thus given by his biographer: “However diligent he was in cultivating the laudable accomplishments of the gentleman and the scholar, yet he never suffered his beloved studies to interfere with his religion, but managed all his affairs in subserviency to it. He often lamented the great consumption of time, occasioned by the numerous visitants to see his museum, but took care that they should not hinder his private or public worship. In his principles, after his conversion, he was orthodox; in his affections, catholic, comprehending therein all denominations of Christians. He was modest and pure, temperate, and abstemious to an uncommon degree; though, being one of the lords of the manor, and a governing member ’of the corporation, he could not always avoid public meetings and festivities, yet he was a sparing partaker, even of innocent diversions.